It's Force Friday II! For those of you who missed it the first time around (how? ), Force Friday was launched two years ago as a way for Disney to showcase all of their shiny Star Wars merchandise leading up to the release of The Force Awakens. It was such a hit that this year Force Friday has returned and with it a whole bunch of very exciting toy reveals from a Galaxy Far Far Away. Over the last few years of fandom, Lego tie-ins have become a terrific place to look out for spoilers and plot reveals for their corresponding forthcoming films. 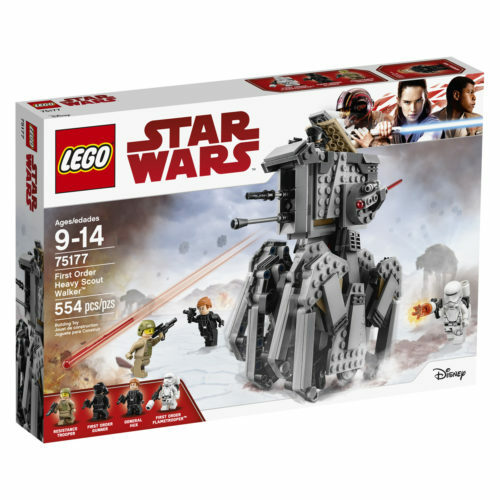 With Force Friday upon us once more, we have a whole new range of incredible Lego sets to celebrate the release of Star Wars: The Last Jedi. We're especially excited as these include some brand new characters who have yet to appear on screen or in mini-fig form, as well as some never-before-seen vehicles. Rose Tico makes her first appearance in Star Wars Lego form alongside fan favorite Finn! We already know these two will be sneaking around casino planet Canto Bight and this set seems to confirm Rose and Finn will be galavanting around the galaxy together! Looks like their might be some turmoil in the inner sanctums of the First Order; in this set, we find General Hux all on his lonesome with nothing but some troopers to keep him company. He does have a rather badass looking First Order Heavy Scout Walker, at least. We'd seen the leaked images, but here is the official reveal of Supreme Leader Snoke in his shiny gold outfit alongside the super-imposing First Order Star Destroyer. Laura Dern Lego is something that we all need and can now finally own, as this set showcases her character Vice Admiral Holdo alongside Poe Dameron and a whole roster of Resistance fighters. We'll definitely be grabbing some of these super rad Star Wars offerings, but will you? Which character do you have to have in Lego form? Why is Kylo not wearing a helmet? What does it mean that there are two different Poe Damerons? Fly your lego tie-fighter into our comments and let us know! Check out our gallery for the full smorgasbord of Star Wars Lego offerings. WANT MORE IN FORCE FRIDAY? What does Luke Skywalker's new look mean for The Last Jedi?